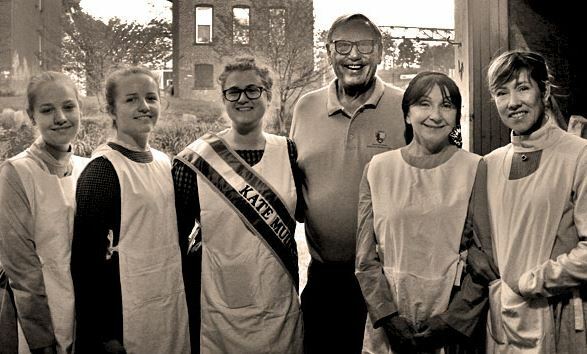 Reenactment of the Troy Collar Laundress Strike of 1864. 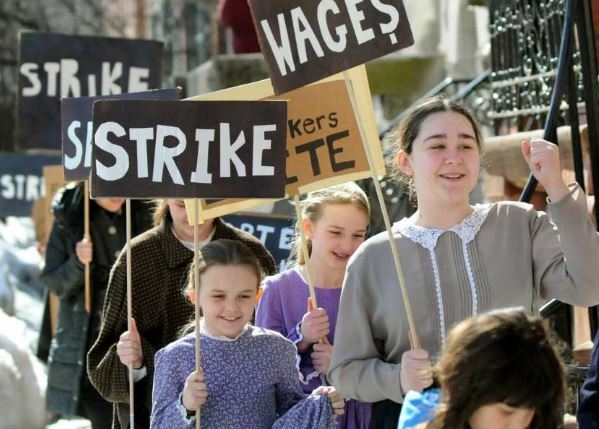 When Mullany was inducted into Labor’s International Hall of Fame in 2016 she and her sister unionists were portrayed by reenactors. 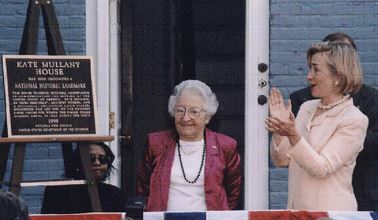 The Kate Mullany National Historic Site was dedicated a National Park Service ceremony in 2008 attended by Sen. Hillary Clinton. 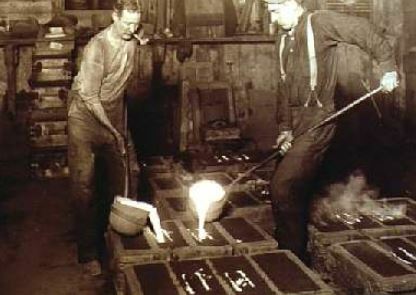 Troy produced more horseshoes for the Union army than all other cities combined. 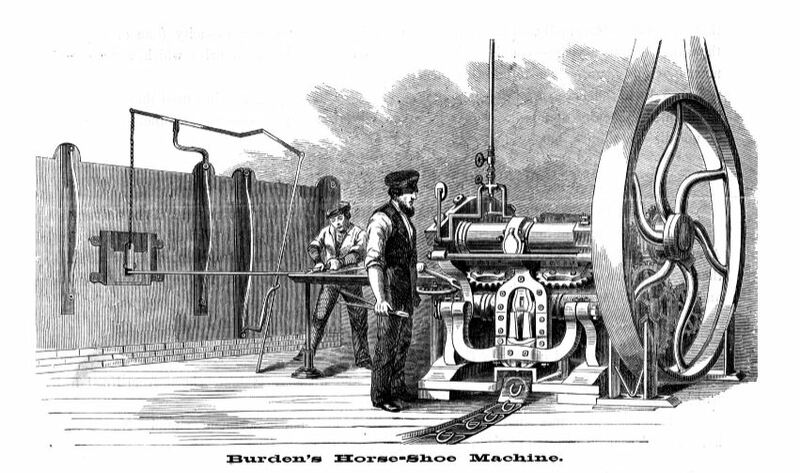 Burden’s Iron Works founded by a Scottish immigrant used a patented machine that could turn out a horseshoe every second. 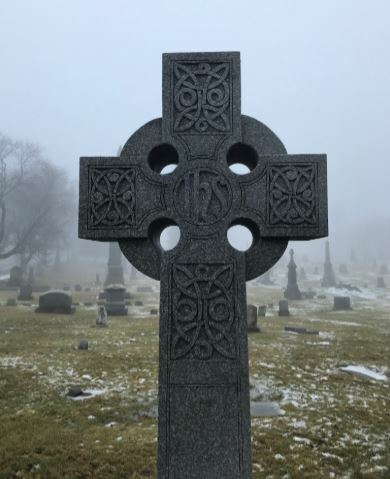 Kate Mullany’s grave in St. Peter’s Cemetery. Photo by Pat Young. *Kate Mullany’s name is alternately spelled “Mullaney” and both spellings appear in the scholarly sources. Recommended Source: This article would not have been possible without the excellent scholarship of Carole Turbin who wrote the first study of women workers and unionization in 19th Troy. Here is the citation for her book, which deserves to be read by anyone interested in the intersectionality of labor, immigration, and gender. Thanks to Michele Ascione for her assistance in preparing this article. The Life and Work of Susan B. Anthony Including Public Addresses, Her Own Letters and Many from Her Contemporaries During Fifty Years Vol. 2 by Ida Husted Harper published by Hollenbeck Press (1898) pp. 999-1000; Worker City, Company Town: Iron and Cotton-Worker Protest in Troy and Cohoes, New York, 1855-84 by Daniel J. Walkowitz published by University of Illinois Press (1981); Working Women of Collar City: Gender, Class, and Community in Troy, 1864-86 by Carole Turbin published by the University of Illinois Press (1992); The Dawning of American Labor: The New Republic to the Industrial Age by Brian Greenberg published by Wiley (2017); “To Toil the Livelong Day”: America’s Women at Work, 1780-1980 edited by Carol Groneman, Mary Beth Norton published by Cornell University Press (1987); The Daughters Of Maeve: 50 Irish Women Who Changed World By Gina Sigillito published by Citadel Press (2007). National Park Service page on Kate Mullany House; Kate Mullany page at National Women’s Hall of Fame; Report on the Condition of Women and Child Wage-earners in the United States U.S Department of Labor Volume 9 (1910) pp. 106-107; America’s Working Women: A Documentary History, 1600 to the Present edited by Rosalyn Baxandall, Rosalyn Fraad Baxandall, Linda Gordon, Susan Reverby published by W.W. Norton (1995); The Social Origins of Private Life: A History of American Families, 1600-1900 By Stephanie Coontz published by Verso (2016); Workers in America: A Historical Encyclopedia, Volume 1 By Robert E. Weir published by Clio Press (2013). Working Women of Collar City: Gender, Class, and Community in Troy, 1864-86 by Carole Turbin published by the University of Illinois Press (1992) pp. 26-28, 33-62.